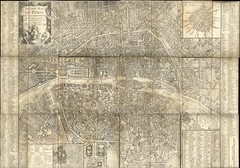 I just scanned a map of Paris that my grandfather had given me few years ago. This map will show you what Paris looked like in 1787, basically small but a lot of streets from that time are still there. It is available on Flickr, click on "All sizes" to see the full size version. Ubuntu's decision to include more proprietary software in next release and install some by default has sent shockwaves through the community. If you are an Ubuntu developer who is concerned about the long term consequences of this decision, you may be interested in switching to a free (like speech) Linux distribution. If you have an interest in being part of a vibrant community that cares about free software, please do join us on Mandriva (or any other project providing a free (like speech) distribution). This is an answer to Mark Shuttleworth as I really don't like how he tries to benefit from issues in other free software communities. Update: Someone had the same idea and provided a better version.